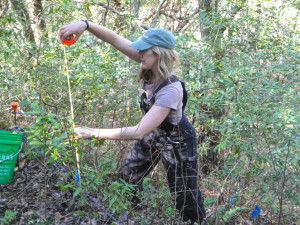 UC Berkeley Ackerly Lab graduate student Meagan Oldfather takes measurements at one of 50 forest plots at Pepperwood. Pepperwood hosts 50 long-term forest monitoring plots in partnership with Dr. David Ackerly and the Ackerly Lab at UC Berkeley’s Department of Integrative Biology. Graduate students and researchers return to the plots each year and collect data on woody vegetation. Located across the preserve, these plots are adjacent to weather sensors that enable scientists to determine how variability among our micro-climates impacts plant life over time. The forest monitoring study at Pepperwood is creating a vital baseline for the health of Northern California forests that will be valuable to researchers for decades to come. In the short term, the data we’re collecting is helping us understand the effects of extreme weather events like California’s historic drought.